Today we’d like to introduce you to Darci Monet. Thanks for sharing your story with us Darci. So, let’s start at the beginning and we can move on from there. I’ve been a professional vocalist since I was 15 and have taken voice lessons off and on for almost as long. I also majored in music in college. I never intended to become a voice coach, truth be told. I was a vocal performance major, not a music education major. However, I quickly learned what many naive young performers do: performing alone doesn’t always pay the bills! So, I had a series of jobs from retail to waiting tables to office work to support myself while I performed live and in the studio singing backup for others. I also had the random student or two for a little extra income whenever someone asked for my help. I didn’t actively pursue coaching as a profession at the time. Turned out I enjoyed it, which was a wonderful surprise, but I just kept it a fun side job. When the housing crash happened in 2008, I was laid off of my (extremely well-paying) office job and there were literally no jobs to be had then. I had been bored out of my blessed mind working in corporate America anyway. I felt like the Universe was telling me to utilize the skill set I’d spent my entire life honing on a full-time basis. So, I decided to start voice coaching in my home as my actual, real job. And that’s how Darci Monet Vocal Style Studio came to be! When you provide a service for people, it’s always a risk to keep yourself afloat. One month you’re flush, the next might barely be making ends meet. Finding clients (students) is also a challenge because while there are tons of singers in Los Angeles, there are also tons of singing teachers. Finding an untapped market is no joke! The competition in L.A. is fierce. I also think that the advent of all the talent competition shows on television have contributed somewhat to an apathy among young singers in that they don’t seem to think they need to invest in voice lessons to become good vocalists. The instant gratification of watching an unknown get plucked out of thousands of hopefuls and tossed onto a huge sound stage each week to sing for millions can be very deceptive. Those are the exceptions to the rule in regard to recognition. All singers, known or unknown, should study the craft of singing to protect their voices and be ready when opportunity presents itself. You only have one set of vocal cords and if you blow them out or they’re not strong enough to get through hours of performing at a time, that’s it. It’s not like breaking a guitar string, which can be replaced. If you want to sing for a living, you owe it to yourself to learn how to do it properly and safely. Adele could probably tell the kids a few things about that right now! Please tell us about Darci Monet Vocal Style Studio. I am a private voice coach. I teach people how to sing or how to improve their singing in a one-on-one environment. My main specialty is teaching chest mix, a technique that keeps a singer from singing too hard or yelling all the way through their songs, therefore sparing them from blowing their voice out. I also specialize in teaching just about any contemporary style. I have a unique perspective as a studio singer who’s had to sing them all herself! If you’re already really good at show tunes but want to find your “country voice” (for example), I can help with that! I’d say lastly, I also really stress being genuine as a performer. A singer can have the most technically pristine voice on the planet, but if the listener doesn’t believe the story they’re telling, it just doesn’t matter. My motto, “Sing Like You Mean It!” comes from that concept – be real. Be genuine. Know the story and tell it. The singer is merely the vessel. The voice is nothing without the song itself. My voice coach in college, the wonderful Carolyn Binkley in Nashville, TN, always used to say in our performance classes after we sang, “So. Did you believe her? Did you believe him?” The audience has to believe you! What probably sets me apart from other voice coaches is that I am not terribly concerned with impressing anyone’s aesthetic sensibilities when they come to see me. There are many vocal studios in Los Angeles who are located in expensive buildings on prime real estate and are loaded with fancy equipment and I say more power to them. All those shiny things are good for attracting clients. I however, get my clients mostly from word of mouth and creating genuine relationships with people because being real is so important to me as a human being as well as an artist. I know the voice and know what I’m doing, but I also am willing to admit that I don’t have all the answers. If I don’t feel like I’m helping you, I will direct you to someone that I think can. I teach in my humble but adorable home. It’s me, my piano and the client’s voice and that’s it. My lessons growing up and in college were exactly that way and it not only taught me how to control and really know my natural, real voice before dousing it in electricity and computer-generated tricks, but allowed me to discover its true power on its own. 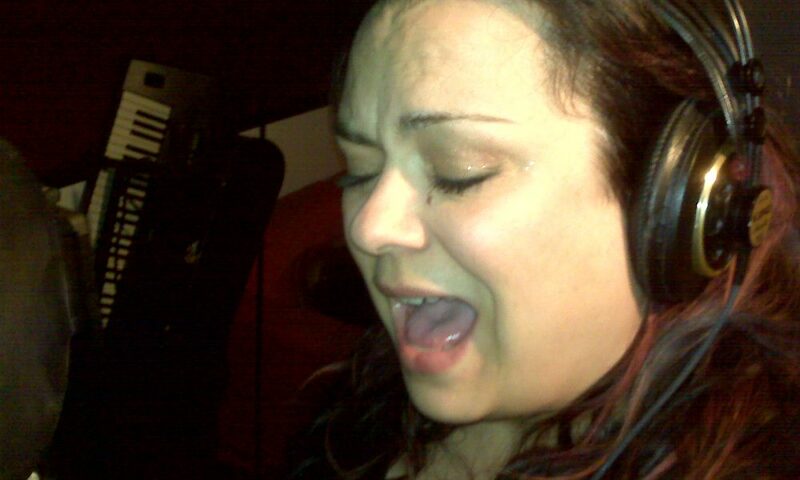 In a town known for its smoke and mirrors and bells and whistles – Tinsel Town, after all – the Darci Monet Vocal Style Studio is all about keeping it real. There is also laughing. Tons and tons of laughing! Probably being on the swingset in my backyard with my sister bellowing out songs from “Oklahoma” at the tops of our lungs! Offering a summer sale on monthly package rates till August 31st, extended till September 30th for VoyageLA readers ONLY. Package must be purchased by 9/30, used by December 31st. Address: Sherman Way and Woodman, right where Van Nuys, North Hollywood, Valley Glen, Sherman Oaks and Panorama City borders meet. Darci can saaaaang! And she can help you sing. I have taken a lesson or two from Darci and she has helped me.